Chess is one of the oldest games that is still popular today. And it continues to go from strength to strength. Whilst there are several rules to learn with regard to how the pieces can move, taking manoeuvres, castling, check and so on, this pales into insignificance when compared to the strategies that can be learned. Chess is a game with such depth that it takes a great many years to truly become great at chess, and indeed some of the greatest chess grandmasters are said to have been able to 'see' in their head an astonishing number of moves ahead and the implications of a particular move now several moves later. However, the good news is that chess puzzles can be a lot simpler than that! And here is a straightforward chess puzzle for you. Look at the image to the right. 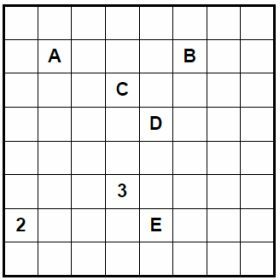 You will see that there are five lettered squares: A, B, C, D and E respectively. Two squares contain numbers: a 2 and a 3. These indicate how many pieces are attacking those squares. A to E represent one each of a knight, king, queen, rook (castle) and bishop in some order. Your task is simply to work out which is which. Remember that a piece cannot attack a square if the attack route is through another square. Can you work out which letter represents each of the five pieces above? You'll need to know how the five chess pieces move in order to solve this puzzle, but there are plenty of excellent guides to the rules of chess elsewhere online, so if you're not sure please check one of those before attempting to solve this puzzle!